This article explores the suitability of a Wii nunchuk based USB accelerometer as an earthquake sensor for the Quake-Catcher Network (QCN) project. It examines the nunchuk over several metrics: precision and range, frequency response, total cost and availability. QCN supports a few different USB accelerometers. The most basic one is the JoyWarrior24F8 (JW24F8), which is a 3 axis accelerometer with 10 bits of precision and a measurement range of +-2g, +-4g, or +-8g. QCN uses the +-2g range. According to WiiBrew, the Wii nunchuk’s accelerometer also has 10 bits of precision over a range of +-2g. Therefore, the nunchuk meets the first criteria for evaluating its suitability as a QCN sensor. I don’t have access to a shake table so I’m unable to directly evaluate the frequency response of the nunchuk based USB accelerometer. However, QCN did provide me with a JoyWarrior24F8 USB accelerometer for comparison. Since the frequency response of the JoyWarrior24F8 was already deemed suitable by Prof. Cochran for QCN, I simply had to attach the JoyWarrior24F8 and the nunchuk to the same substrate, shake them by hand at various frequencies while recording data from both sensors simultaneously, and compare the Fourier transform of the nunchuk’s data to the transform of the JW24F8’s data. Here are comparisons of an official (i.e. STMicroelectronics accelerometer) nunchuk to the JW24F8. The microcontroller code used was mega32u4_hard-i2c_no_filter.zip and the plots were made using the Octave scripts found in the code section below. The STMicroelectronics based nunchuk appears to have a response that is very similar to the JW24F8’s response. It should be noted that I was shaking the accelerometers by hand so I don’t think I covered the entire range of frequencies of interest. Unfortunately, there are fake (i.e. 6331 accelerometers) nunchuks that are unsuitable earthquake sensors because their accelerometer data has stuck bits. Even worse, it can be very difficult to impossible to tell if a nunchuk is official by external examination only. The nunchuk uses I2C to transfer its data. 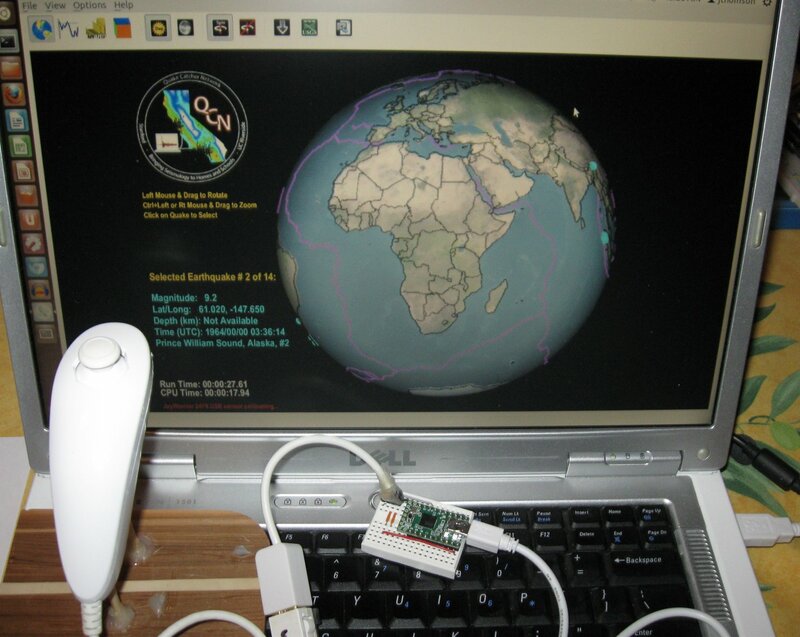 Therefore, a microcontroller that supports USB and I2C is required to read the data from the nunchuk, filter it, and pass it to the host computer. Three different microcontrollers were evaluated: an ATmega32U2 board that supports hard USB and soft I2C, an ATmega328P with V-USB that supports soft USB and hard I2C, and an ATmega32U4 (teensy) that supports hard USB and hard I2C. The ATmega32U2 only works with 6331 based nunchuks and only at 100 kHz. The ATmega328P works with both STMicroelectronics and 6331 based nunchuks, but the two-wire interface (TWI) eventually locks up for an unknown reason. The ATmega32U4 works with both types of nunchuks tested and with no crashes observed over a two-week period. The STMicroelectronics nunchuk works at 100 and 200 kHz with hard I2C only. The 6331 based nunchuk works at 100, 200, and 400 kHz when hard I2C is used. A Quake Catcher Kit from Saelig is $42.25 with about $12 for shipping to a U.S. residence, for a total of $54.25. A Teensy with a 3.3V regulator and shipping costs about $22. A genuine, official nunchuk is approximately $20 shipped. A nunchuk extension cable from eBay is around $4.50. For a total price of $46.50. However, the cost of a proper mount for the nunchuk as well as the labor cost of assembly has not been included. Therefore, I believe that Quake Catcher Kit is most likely a better deal for your time and money. All of the code in one GitHub repo. The output resulting from microcontroller code that didn’t filter the accelerometer data was the most similar to the output of the JW24F8. Code that filters the accelerometer data with Chebyshev and moving-average filters is included for comparison purposes and because I’d already written it. This code is for research purposes only; it uses an Atmel USB VID/PID pair for LUFA demos only. This code doesn’t work with QCN because the QCN software checks the joystick’s name to make sure it’s a JoyWarrior. This code can be easily made to work with QCN by modifying its USB descriptors, which I’ve done, but I won’t be releasing this code since it uses Code Mercenaries’s VID/PID. 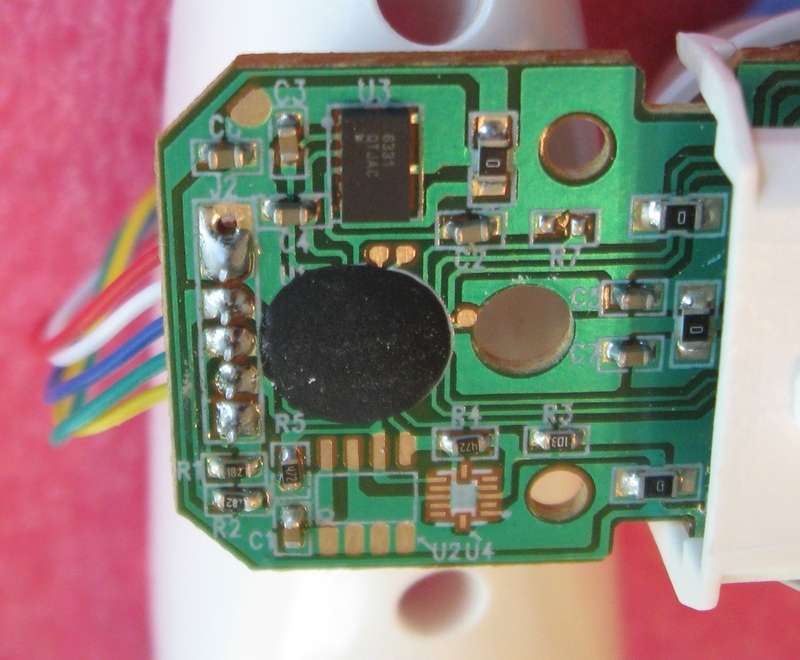 The code also checks the connected controller’s identification bytes to make sure its a genuine Wii nunchuk. It doesn’t work with fake nunchuks. While evaluating the suitability of a Wii nunchuk as an earthquake sensor (article not yet published), I discovered a few things about non-official nunchuks that use an accelerometer with the markings 6331 over QS***, where the asterisks stand in for a three letter code. This website (translated PDF) says these accelerometers are MMA6331L chips, but I’m not certain if they are genuine Freescale parts. The 6331 nunchuks don’t behave the same as the original nunchuks, which use an STMicroelectronics’ accelerometer. The 6331 nunchuks differ from the original in two important ways. First, the 6331 based nunchuks don’t encrypt their data whether they are initialized using the old or the new method. This is important because there is a lot of microcontroller code on the web for reading data from a nunchuk that uses the old initialization method and decrypts the nunchuk data. Using this code on a 6331 based nunchuk will result in mangled data caused by incorrectly applying the decryption routine on unencrypted data. The solution is to use the new initialization method. This method causes an STMicroelectronics based nunchuk to output unencrypted data. Since the 6331 based nunchuks output unencrypted data no matter the initialization method, it’s better to use the new method without a decryption routine so your code will support both types of nunchuks. Second, the accelerometer data in 6331 based nunchuks have some bits that are permanently fixed (i.e. stuck at 0 or 1). Bit 0 of byte 2 is always zero, bit 0 of byte 3 is always one, and bit 0 of byte 4 is always zero. Bits 3, 4, and 5 of byte 5 are also stuck at zero. Each axis of accelerometer data is represented by 10 bits with the 2 least significant bits of each axis stuffed in byte 5. When bytes 2 through 4 are transformed into accelerometer axis data, Table 1 can be rearranged to get Table 2. I have no idea why the accelerometer data in 6331 based nunchuks have some bits stuck like this. My first guess was that it had something to do with the Wii Motion Plus’s passthrough mode. The Wii Motion Plus (WM+) has a passthrough mode that interleaves nunchuk data with motion plus data. The WM+ discards some of the nunchuk’s LSBs to make room for bookkeeping bits. So I thought that since newer Wiimote’s include WM+ maybe the 6331 nunchuks don’t bother with the bits that will be discarded anyway. However, the bits discarded by the WM+ don’t match up with the fixed bits of the 6331 based nunchuks. Unfortunately these fake nunchuks aren’t as easy to avoid as one might think. A nunchuk I purchased off of Amazon, which was advertised as official and looks genuine, has the same 6331 accelerometer and board as an obviously fake nunchuk I bought on eBay. The one I bought from amazon has a rubberized joystick, triwing screws, and the Nintendo logo. There are a few ways to tell if your nunchuk is 6331 based. The most thorough method is to open the nunchuk and look for an accelerometer on the side of the board opposite the joystick with the markings 6331 over QS***, where the asterisks stand in for a three letter code. Another method is to use a program that performs the old initialization method and decrypts the data. When the joystick is centered the x-axis for the joystick (not the accelerometer) should be around 128. If the x-axis reads around 174 then the decryption algorithm has mangled unencrypted data. The decryption algorithm is (x xor 0x17) + 0x17 or in decimal (x xor 23) + 23. Therefore, (128 xor 23) + 23 = 174. 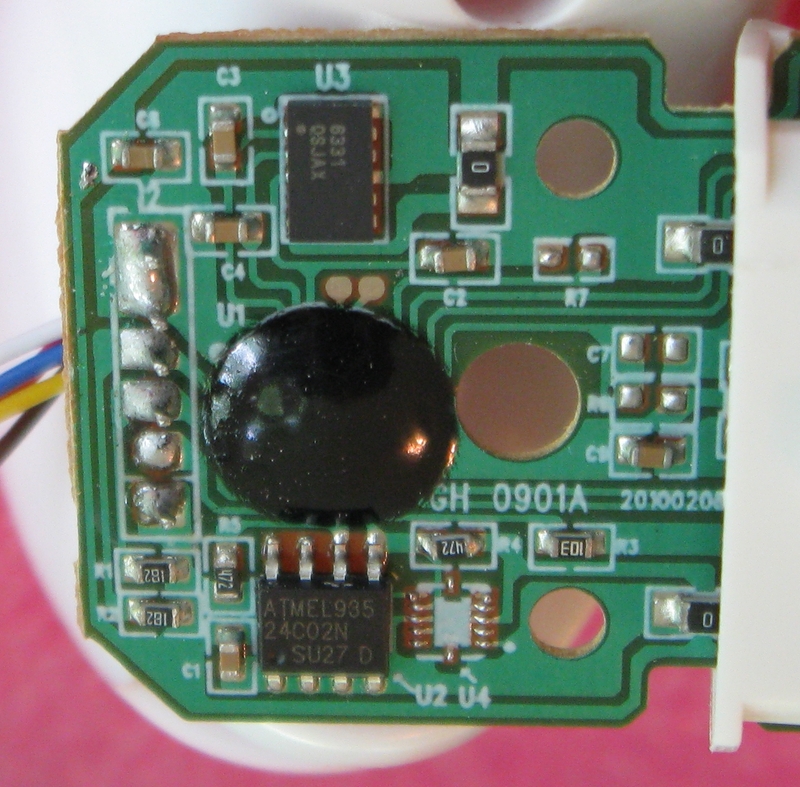 The STMicroelectronics accelerometer inside an official nunchuk. The official nunchuk also has a shielded cable. Inside an fake/knock-off nunchuk purchased on eBay. 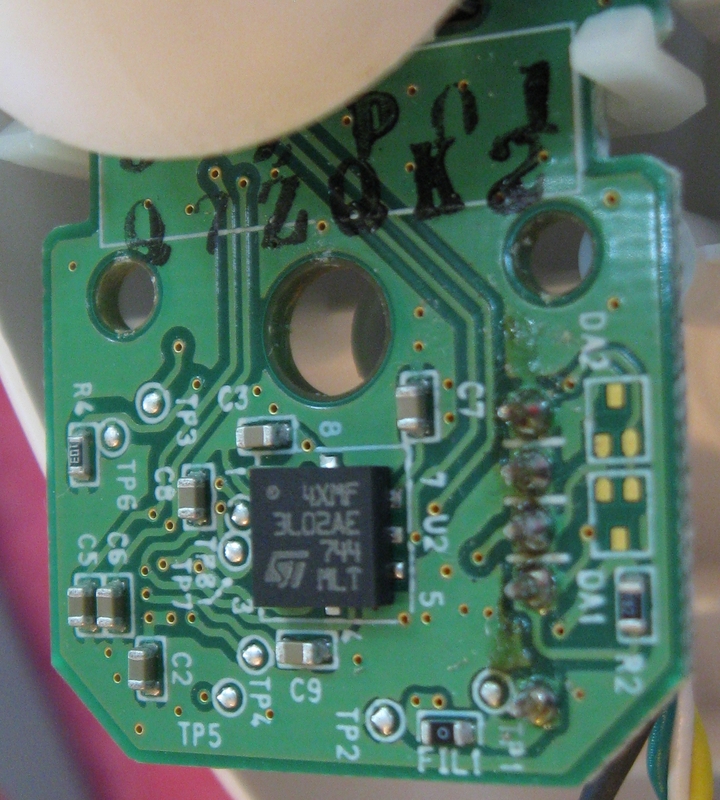 The board of a nunchuk that looks official from the outside but is actually fake. Notice that the EEPROM spot populated. The pinout of the 6331 as seen on the fake nunchuk’s board appears to agree with the datasheet except for one strange exception. The nunchuk is a three axis device, but the datasheet says the MMA6331L only measures x and y axis data. Pin 4 of the datasheet says it has no internal connection but on the board pin 4 has a trace that is connected to a filter capacitor and the microcontroller just like pins 2 and 3, which are the x-axis and y-axis data pins! It should also be noted that the MMA6331L’s minimum range is +-4g, where the STMicroelectronic’s nunchuk measures acceleration over the range +-2g. If you have any information to share, please leave a comment below. I’m particularly interested to hear why 6331 based nunchuks have some of the accelerometer data bits stuck or how to unstick them. I’d also really like to hear what sort of accelerometers are being used in the nunchuks that come packaged with the newest Wiis.